In “A Terrible Cyclone,” one of our many in-depth features in Military Heritage Magazine’s March 2014 edition, writer Lawrence Weber explains that Braxton Bragg’s problems began long before the battles at Chickamauga. Everywhere he went, he seemed to carry with him a cloud of disappointment and failure. Humiliated by the lack of confidence his lieutenants had demonstrated in his ability to successfully command, Bragg decided to ask his generals for a vote of confidence. The vote backfired on him, and he was openly rejected by the majority of his fellow generals. On the eve of the Chickamauga Campaign, he had all but lost the morale of his army. In this riveting story by William Welsh, you’ll read about how rebellious 14th-century guild workers stood their ground against King Philip IV’s deadly knights in the Battle of the Golden Spurs, shaking feudal society to its core. British Field Marshal Bernard Montgomery’s attack on a key road network was met by German units with enough armor to inflict heavy damage on the Allies. But as Kelly Bell reports, the British and Canadians never shrank from their daunting adversary. In July 1644, Prince Rupert’s Royalists sought to secure the north of England for King Charles I, but the Parliamentarians had other ideas. As you’ll read in this column by Eric Niderost, the Battle of Marston Moor would decide the matter for both sides. A British counteroffensive led by Colonel Robert Clive in the Bengal region of India in 1757 culminated in a showdown with the Nawab of Bengal during a driving monsoon. Louis Ciotola gives you the full story. In addition to our features, this month’s departments include several riveting stories: viking bodyguards, the famed M79 grenade launcher and the Hitler assassination attempt dubbed “Operation Foxley”—you’ll find it all inside. 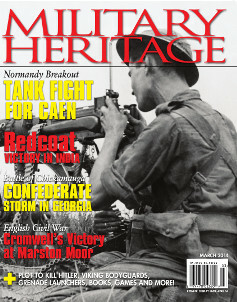 At Warfare History Network, we strive to bring you compelling and in-depth stories that welcome discussion and debate. So what do you think? Was Braxton Bragg’s vote of no confidence deserved? How did his relationship to his other Confederate generals shape the events at Chickamauga? Let us know in the comments below. Tags Allies, Bernard Montgomery, Chickamauga, Colonel Robert Clive, Confederate Army, confederate general, confederate generals, England, Features, Flemish Lion, general, General Braxton Bragg, general james longstreet, German, King Charles I, King Philip IV, military, Prince Rupert, Royalist, warfare history.